A few times a year, the Bureau of Labor Statistics (BLS) publishes a Spotlight on Statistics Article. The first such article of 2015 recently arrived, providing analysis of trends in long-term unemployment. Certainly an interesting read on its own, but some of the included data gives us a good opportunity to look at how thought can improve your regression analysis. 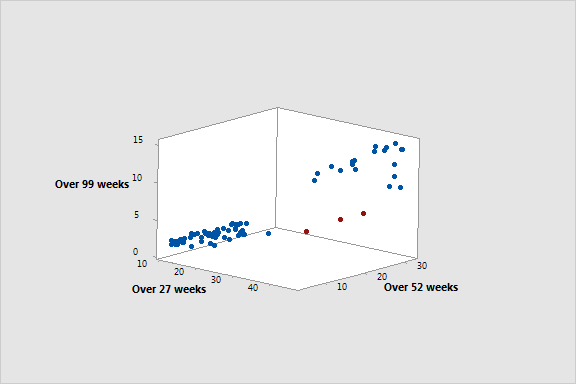 Fortunately, Minitab Statistical Software includes 3-D graphs and Regression Diagnostics that can help you spot opportunities for improvement. The discussion points out an interesting relationship. 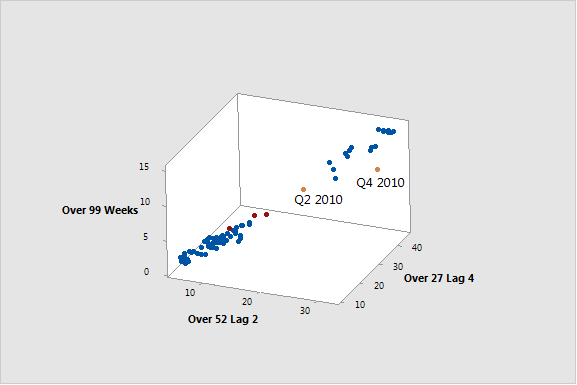 The authors note that the record high for those unemployed 27 weeks or longer occurred in the second quarter of 2010. 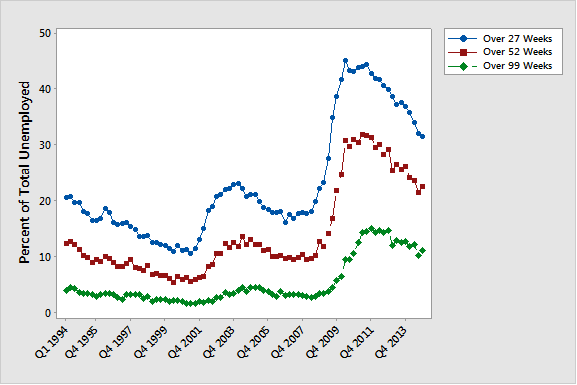 The record high for those unemployed 52 weeks or longer occurred in the second quarter of 2011. The record high for those unemployed 99 weeks or longer occurred in the 4th quarter of 2011. That is, the highest proportion of unemployed in each category happens earlier for shorter terms. When your data are set up like this, it’s natural to want to analyze the data this way. The relationship that you get this way is strong. If you looked at the R-squared statistics, you might stop. I’ve marked the points on this graph that have unusual predictor values. In the diagnostic report for the model, we can see that these points are followed by large standardized residuals. That is, the lag that the article pointed out in the maximums shows up in the regression relationship as well. If you think about the predictor variables, this makes perfect sense. The BLS report notes that finding a job is less likely the longer you are unemployed. People unemployed for more than 27 weeks can become people who are unemployed for longer than 52 weeks. People who are unemployed for more than 52 weeks can become people who are unemployed longer than 99 weeks. So what are the right predictors to use for the percentage of the unemployed for longer than 99 weeks? The closest we can get with terms provided is probably that people who are unemployed for over 27 weeks can become people who are unemployed for over 99 weeks about 4 quarters later. Similarly, people who are unemployed for over 52 weeks can become people who are unemployed for over 99 weeks about 2 quarters later. To get these variables in Minitab, use the Time Series menu. Choose Stat > Time Series > Lag. In Series, enter 'Over 27 Weeks'. In Store lags in, enter ‘Over 27 Lag 4’. In Series, enter 'Over 52 Weeks'. In Store lags in, enter ‘Over 52 Lag 2’. Highlighting the same 3 points from the first graph in red, the points don’t seem unusual at all. In fact, these points don’t appear in the diagnostic report anymore. One point still has a large standardized residual and it is preceded by an unusual X value. But the regression that compare appropriate time frames explains more variation in the data than the regression that compares simultaneous ones. Minitab Statistical Software provides a number of ways for you to evaluate your regression model. If your diagnostics reveal model inadequacies, the you have a lot of easy ways to make improvements. I used lag to create appropriate variables. If you’re ready for more, check out how Bruno Scibilia uses includes interactions in his model for wine tasting or explains the benefits of a Box-Cox transformation.